"...Thracian people is second largest after the Indian. Thracian tribes have a lot of names … and obey the same laws except the Getae,… tribe which lives above the crestones. " Geography defines the so-called, "Ludogorie" to be situated among the Dobrudja plateau on the north and north-east; "Elia" (Dunabe river side) on the north-west and the valleys of Beli Lom and Pomoriiska rivers on the south and south-west Ludogorie is one of the important agricultural regions of Bulgaria nowadays. Its landscape, however, is far from our vision of one-time sea of forests. There are still a few places which have preserved not only the nature but some traces of life of the tribes and people who have lived there for ages, as well. 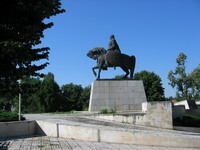 In the northeast section of Razgrad region the municipality of Isperih is situated. Historical and Archeological Reservation Sboryanovo is on its territory. There ancient monuments and almost untouched by time natural environment co-exist in harmony, according to recent paleographic researches. 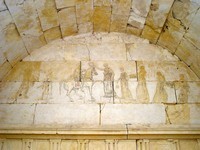 It is a unique place consisting of settlements, sanctuaries and necropolises from ancient times up to the present day. It is a place where rare animals and plants could still be seen. It is the west part of Ludogorie plateau between Malak Porovets and Sveshtari villages. At the beginning of 1st. millennium B.C. the greatest cultural, religions and, later, political centre in the north Thracian lands grows up. It was based by Getae tribes. It was the beginning of the Iron Age on the Balkans, a time of economic and cultural upheaval. From this time the greatest and oldest sanctuary on Sboryanovo territory originates. So does the mound necropolis consisting of five tumuli. The charm of Historical and Archaeological Reservation Sboryanovo is not only in the preserved ancient monuments and the live ritual tradition but in its unique natural features as well. Like an islet left from the one-time sea of forests, preserved miraculously in the cultivated milieu of North-East Bulgaria, a kingdom of animals, birds and rare plants that have long disappeared in other places, nestling among the cozy meanders of the Krapinets River, the Historical and Archaeological Reservation Sboryanovo awaits its visitors and connoisseurs.